Do you take time to celebrate all the seasons in your life? Do you know what I mean? We celebrate things like Christmas, 4th of July, New Year's Day, Birthdays, 21st, 30th, 40th (over the hill and ready to roll), 50th (half-century) Thanks so much, society, for that little reminder. Goodness, we even celebrate Groundhog Day! If we go to all that trouble for those holidays, surely we should, in some way, celebrate the 'actual' Seasons in our lives. Which, I guess, is my way of saying, I like each season to be represented and celebrated at my home, for everyone to see, and all that visit, to know that I am embracing this and every other day of the year. There is no such thing as just a plain old day! Every single moment we are given is a Blessing from God! So let's do it right and celebrate that! So, here is my little way of celebrating Spring this year! If you've never made a wreath and would like to see how easy they can be to assemble, check out my instructions on some of my earlier shares with you. Just search the word Wreath in the upper right-hand corner of my blog or google How to make your own wreath, either will show you that it's not as daunting of a task as you may have thought. I made a beautiful little floral cone to hang on my wall, super simple, the blooms I bought were originally intended for this very wreath. Lucky me! There was plenty for both! I just love this time of year. The sun has not become too hot to enjoy the outdoors, and at most you may need an evening sweater, but, who doesn't like that?! I am so happy I bought as much as I did, of these silk flowers, because I truly can't get enough of these beautiful vibrant colors! In case you didn't get a chance to read about my floral cone yet, I bought these stems at Michael's and was lucky to get the whole lot for 70% off!! Total cost for this my floral cone and this beautiful wreath combined was a grand total of $15.78! Why wouldn't anyone want to do something like this for that price?! Just to make sure you have it, that comes to a grand total of $7.89 each! That's my perfect dollar amount! As much as I love to make and display these wonderfully welcoming decors, I have to be responsible financially as well. A little coupon cutting and shopping on the right day allows me to do that. Do you celebrate the Seasons? What wonderful thing could you do around your house to make each day the wonderful gift that it is? I know life gets us busy, but surely we can all find and hour (or even 15-20 minutes) here or there to embrace each season of our life with glory and gratitude! I am grateful for all of you and hope that you are enjoying each day. Beautiful people, I share with! So Excited to tell you this post was Featured by these wonderful Ladies!! That is GORGEOUS! You are so talented at making wreaths... and, I love to celebrate the seasons, too... spring and fall are my favorites, but I do love to celebrate each and every one! Hugs to you! Thank you, Heather! I am so glad to hear that! Somehow, it doesn't surprise me, though. I love Fall, too! Hugs back to you! Your wreath is so fresh and lovely! I love the colors and the little butterfly! Thank you for sharing with us! Thank you so much Gina! it was my pleasure! So pretty! You did a fabulous job! 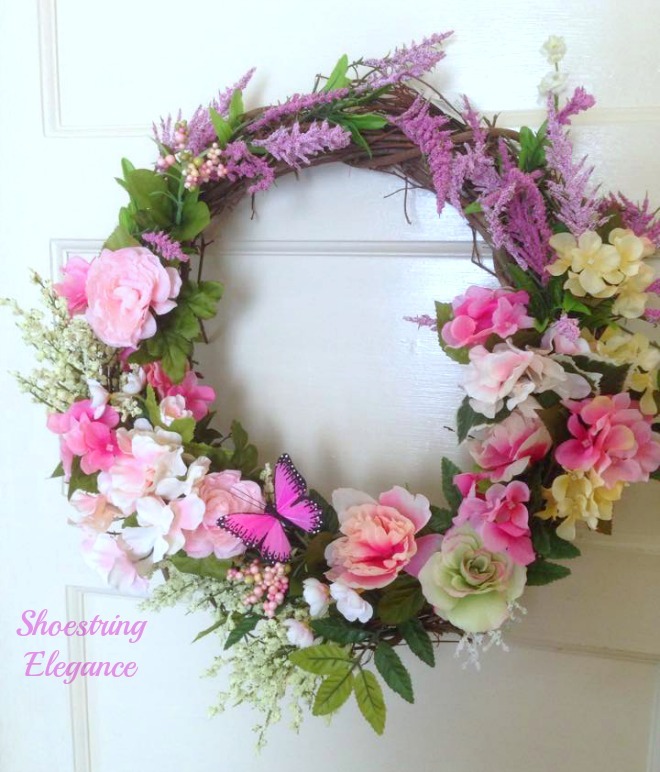 Your wreath is so pretty in pink and lavender...I miss decorating with those beautiful colors! Sounds like it's time for someone to make a run to Michael's or Hobby Lobby!! Thanks for your lovely comment! Gorgeous wreath! I love the colors-and that butterfly is adorable!! Thank you so much for sharing at The Wonderful Wednesday Blog Hop! Thanks so much for having me, CD! I am in love with this. I wish I had more craft ability. Thank you, Rebecca! I think you underestimate your own abilities, you should give it a whirl! This came out so pretty, Theresa. Your wreath is lovely, Theresa! The sentiment behind it is just as lovely! 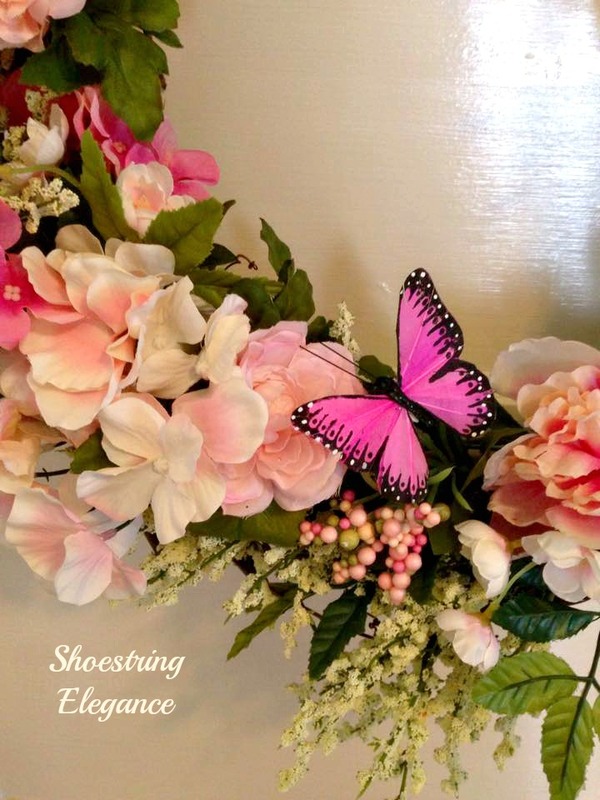 Thanks for sharing on the Spring Craft Blog Hop. Hi Theresa, I found your wreath on Friday Five Features, I need ideas for my door wreath, I love the colors you have created a beautiful wreath, if one like this was in a store it would probably be at least $50.00. Thanks so much, Karren! I'm popping over to share! Great bargain. I would NEVER have guessed you were able to do such a lush wreath at that price. Gorgeous and I love the colors. I am a seasonal decorated also. HPS! Thank you , Susan! It's all about double coupons! Glad you celebrate, as well! HPS! 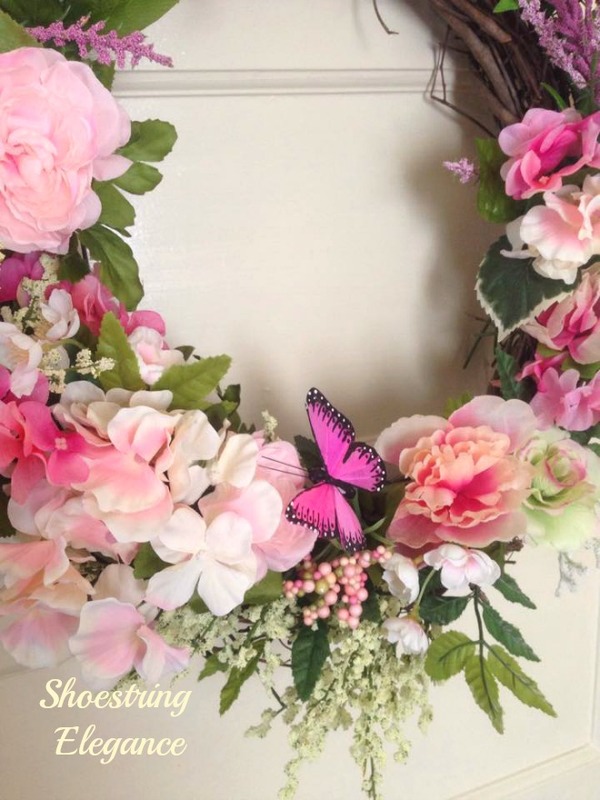 I love the whimsy the little butterfly gives that beautiful wreath. So,so so pretty. You did an excellent job. Thank you so much, Katherine! I'll be coming by on Monday for sure!! 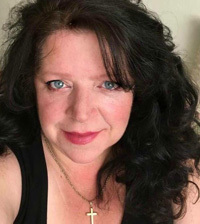 Very pretty Theresa! Thank you for joining Home Sweet Home! Such a beautiful wreath. I love the soft colors. 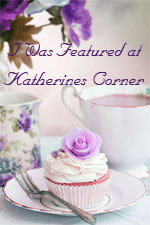 I found your blog from Wacky Wednesday Featured Bloggers. Beautiful! You've inspired me. I've made Christmas Wreaths before. 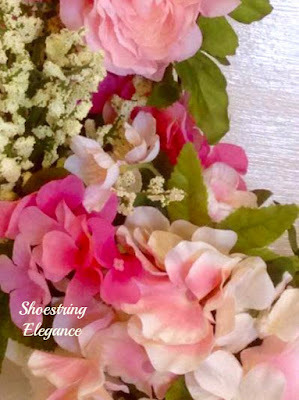 May give spring flower wreath making a try too! Stopping by from Wake Up Wednesday Linky Hop! Thanks so much, Melissa, I hope you do make yourself one so, too! So much fin! I love that butterfly too! Your wreath is gorgeous! I've never made one, you 've given me inspiration to do so! Thanks for sharing! That's great, Ntina! T hope you make one for yourself! Let me know how it goes.